Because of their large size, elephants have a huge impact on their environments and are considered keystone species. Their habit of uprooting trees and undergrowth can transform savannah into grasslands; when they dig for water during drought, they create waterholes that can be used by other animals. They can enlarge waterholes when they bathe and wallow in them. At Mount Elgon, elephants excavate caves that are used by ungulates, hyraxes, bats, birds and insects. Elephants are important seed dispersers; African forest elephants ingest and defecate seeds, with either no effect or a positive effect on germination. The seeds are typically dispersed in large amounts over great distances. In Asian forests, large seeds require giant herbivores like elephants and rhinoceros for transport and dispersal. Apparently their impact on the environment is expanding to larger duties. These giant creatures are now picking up trash in the wild and putting it in the cans. This video is absolutely remarkable. 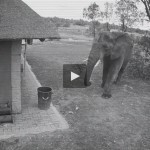 If elephants can pick up litter why can’t we?